I’ve written before about Squares on the Coordinate Grid, an Illustrative Mathematics task using coordinate geometry. CCSS-M G-GPE.B.7 Use coordinates to compute perimeters of polygons and areas of triangles and rectangles, e.g., using the distance formula. How do you provide opportunities for your students to practice I can look for and make use of structure? How do you draw a square with an area of 2 on the coordinate grid? It helped some students to start by thinking about what 2 square units looks like, which was easier to see in a non-special rectangle. What’s true about the side length of a square with an area of 2? How could we arrange 2 square units into a square? How do you know the figure is a square? Is it enough for all four sides to be square root of 2? 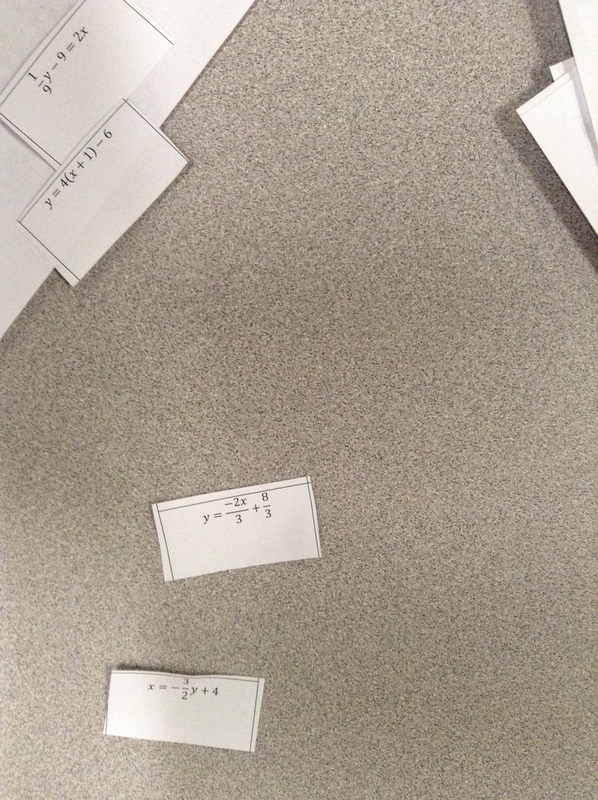 We had been working on a unit on Coordinate Geometry. How do you give students the opportunity to practice “I can look for and express regularity in repeated reasoning”? When we have a new type of problem to think about, I am learning to have students estimate the answer first. I asked them to “drop a point” at the centroid of the triangle. We looked at the responses on the graph first and then as a list of ordered pairs. What is significant about the coordinates of the centroid? Students then interacted with dynamic geometry software. What conjecture can you make about the relationship between the coordinates of the vertices of a triangle and the coordinates of its centroid? Some students needed to interact on a different grid setup to see a relationship. After a few minutes, I sent another poll to find out what they figured out. 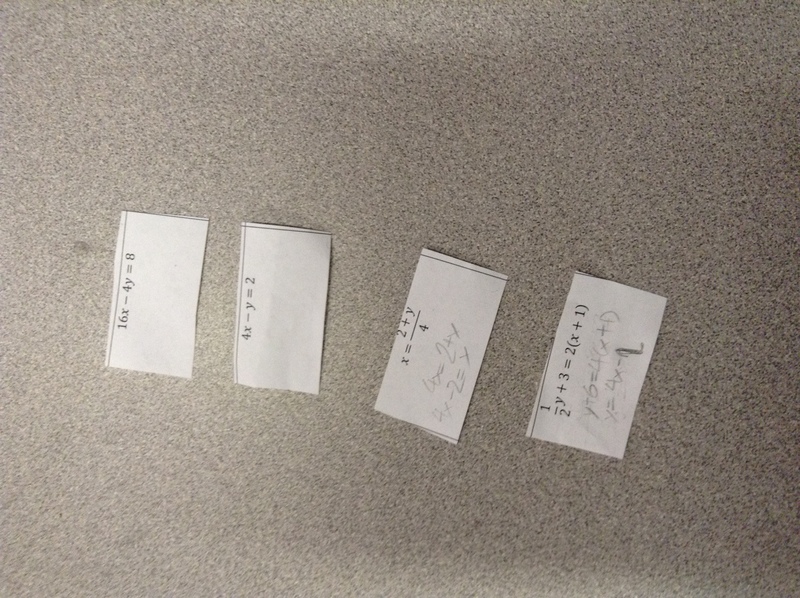 And then we confirmed student conjectures as a whole class. 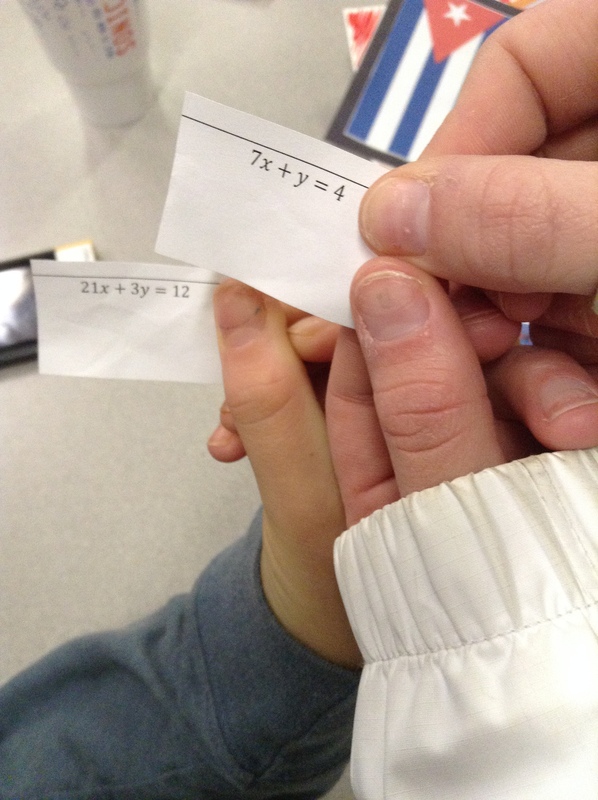 Last year we sorted students into teams using cards at the beginning of each unit. All cards can be found at this link. 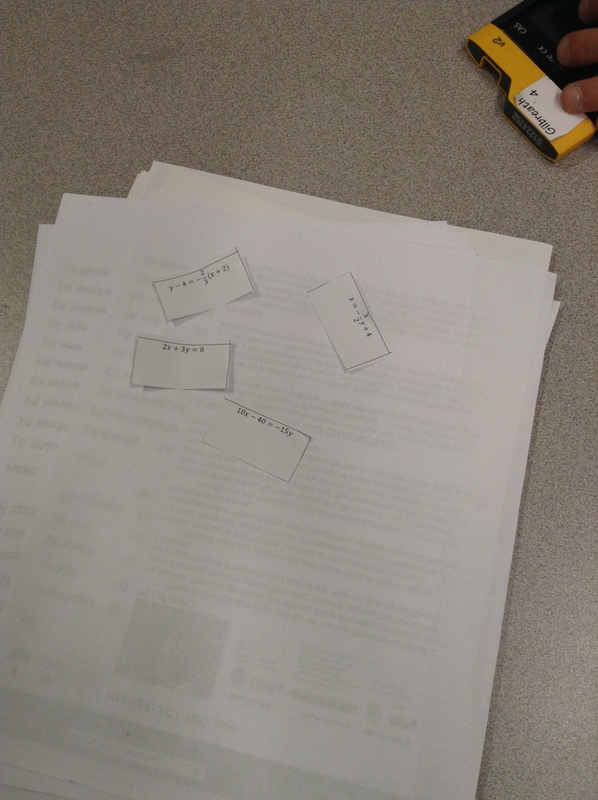 The following are some of the comments that we overheard when students sorted for their Coordinate Geometry unit. Equations! I can do equations. If this is algebra, I’m going to do great in this unit. Are we a team because we both have 18x? If your slope equals -7, you are here. Oh! We are doing slopes! Ours all look like 4x-y=2. When we asked students at the end of the year what to stop, start, keep, and change, many said that we should keep the Team Sorting Cards. They enjoyed changing teams for each unit and getting to know and work with most of the students in the class. You can read about previous team sorting here and here.